Tenor Sylvia Izzo received her official Harmony Inc. pin and was welcomed by her sisters in song at Harmony Heritage’s February 19th rehearsal. The pin was presented by HH chapter president Kim Thompson. Harmony Heritage Chorus, the Pawtucket, RI chapter of Harmony, Incorporated, an international organization of female a cappella singers specializing in the barbershop harmony style, will hold open rehearsals every Tuesday evening, beginning on January 8th. Female singers of all ages and musical backgrounds are encouraged to attend. Rehearsal begins at 7:15 PM at St. Paul’s Episcopal Church, 50 Park Place in Pawtucket, RI. For more information about Harmony Heritage chorus, visit http://www.harmonyheritage.org or call Barbara-Ann MacIntosh at 401-560-0073 or joyhi@cox.net OR Mary Levasseur at 508-930-5362 or at marylevasseurc21@comcast.net. About Harmony Heritage Founded in 2001, the Southern New England chapter of Harmony, Inc., also known as the Harmony Heritage chorus, brings four-part a cappella harmony to the local community through regular performances and educational events. The chorus consists of women representing a wide range of musical backgrounds, from novice to trained professionals, and performs under the direction of Bob O’Connell. Harmony Heritage rehearses at 7:15 PM on Tuesdays at St. Paul’s Episcopal Church, 50 Park Place, Pawtucket, RI. For more information, visit http://www.harmonyheritage.org . About Harmony, Incorporated: Harmony, Inc. is an international, non-profit organization whose purpose is to empower all women through education, friendship and a cappella singing in the barbershop style. Founded in Providence, RI in 1959, the organization has expanded from its Eastern roots to include more than 60 chapters in the United States and Canada, from California to Newfoundland, and from Manitoba to Florida. For more information, visit http://www.HarmonyInc.org . For more information about Harmony Heritage chorus, visit http://www.harmonyheritage.org or call Barbara-Ann MacIntosh at 401-560-0073 or joyhi@cox.net OR Mary Levasseur at 508-930-5362 or at marylevasseurc21@comcast.net. Founded in 2001, the Southern New England chapter of Harmony, Inc., also known as the Harmony Heritage chorus, brings four-part a cappella harmony to the local community through regular performances and educational events. The chorus consists of women representing a wide range of musical backgrounds, from novice to trained professionals, and performs under the direction of Bob O’Connell. Harmony Heritage rehearses at 7:15 PM on Tuesdays at St. Paul’s Episcopal Church, 50 Park Place, Pawtucket, RI. For more information, visit http://www.harmonyheritage.org . About Harmony, Incorporated: Harmony, Inc. is an international, non-profit organization whose purpose is to empower all women through education, friendship and a cappella singing in the barbershop style. Founded in Providence, RI in 1959, the organization has expanded from its Eastern roots to include more than 60 chapters in the United States and Canada, from California to Newfoundland, and from Manitoba to Florida. For more information, visit http://www.HarmonyInc.org . Pawtucket, Rhode Island, August 20, 2018 — Harmony Heritage Chorus, the Pawtucket, RI chapter of Harmony, Incorporated, an international organization of female a cappella singers specializing in the barbershop harmony style, will host a New Singers Night on Tuesday, September 18th. Female singers of all ages and musical backgrounds are encouraged to attend the event, which will take place at 7:15 PM p.m. at St. Paul’s Episcopal Church, 50 Park Place in Pawtucket, RI. Harmony Heritage chorus primarily sings in the barbershop harmony style, which traces its musical roots back to the turn of the 20th century. Today, barbershop harmony singers not only celebrate the classics, but also put their own spin on contemporary songs as well. For more information about Harmony Heritage chorus, visit www.harmonyheritage.org or call Barbara-Ann MacIntosh at 401-560-0073 or joyhi@cox.net OR Mary Levasseur at 508-930-5362 or at marylevasseurc21@comcast.net. Pawtucket, Rhode Island, December 2017 — Harmony Heritage Chorus, the Pawtucket, RI chapter of Harmony, Incorporated, an international organization of female a cappella singers specializing in the barbershop harmony style, will hold open rehearsals every Tuesday evening, beginning on January 9th. Female singers of all ages and musical backgrounds are encouraged to attend. Rehearsal begins at 7:15 PM at St. Paul’s Episcopal Church, 50 Park Place in Pawtucket, RI. Harmony Heritage chorus primarily sings in the barbershop harmony style, which traces its musical roots back to the turn of the 20th century. Today, barbershop harmony singers not only celebrate the classics, but also put their own spin on contemporary songs as well. For more information about Harmony Heritage chorus, visit http://www.harmonyheritage.org or call Barbara-Ann MacIntosh at 401-560-0073 or joyhi@cox.net OR Mary Levasseur at 508-930-5362 or at marylevasseurc21@comcast.net. Pawtucket, Rhode Island, December 1, 2017 — Harmony Heritage Chorus, the Pawtucket, RI chapter of Harmony, Incorporated, an international organization of female a cappella singers specializing in the barbershop harmony style, will be special guests at St. Kevin’s Annual Parish Christmas Concert, to be held at the church on Friday, December 8th at 7 PM. The concert is free and open to the public, but audience members are encouraged to bring canned food donations for the church’s food pantry. St. Kevin’s Church is located at 333 Sandy Lane in Warwick, RI. The event, a popular annual tradition featuring the choirs from St. Kevin’s and St. Rita’s parishes in Warwick, will also include talented soloists singing Christmas favorites and a little Broadway, cast members performing music from Granite Theater’s production of Jesus Christ Superstar, a surprise guest or two or three, and even Santa, direct from the North Pole! The Harmony Heritage chorus is an award-winning chapter of Harmony, Inc. and performs under the direction of Bob O’Connell, an accomplished director, performer, arranger and musician. Harmony Heritage chorus primarily sings in the barbershop harmony style, which traces its musical roots back to the turn of the 20th century. Today, barbershop harmony singers not only celebrate the classics, but also put their own spin on contemporary songs as well. For more information about Harmony Heritage chorus, visit www.harmonyheritage.org or call Barbara-Ann MacIntosh at 401-560-0073 or Mary Levasseur at 508-336-6956. Pawtucket, Rhode Island, August, 2017 — Harmony Heritage Chorus, the Pawtucket, RI chapter of Harmony, Incorporated, an international organization of female a cappella singers specializing in the barbershop harmony style, will lead a free harmony performance and workshop at the Seekonk Public Library on 410 Newman Avenue in Seekonk, MA. The workshop will take place on Wednesday, September 13th from 6:30 – 7:45 PM. This free, participatory event will show how the four different voice parts – tenor, lead, baritone, and bass – work together, while showcasing the wide range of musical possibilities contained in this timeless style of a cappella singing. Members of the audience will be invited to try out the parts and to sing selected songs with the chorus. This program is supported in part by a grant from the Seekonk Cultural Council, a local agency which is supported by the Massachusetts Cultural Council, a state agency. Pawtucket, RI, May 17, 2017 — Harmony Heritage Chorus, the Southern New England chapter of Harmony, Incorporated, an international organization of female a cappella singers specializing in the barbershop harmony style, recently earned regional recognition and qualified for a spot in the Silver Division at Harmony, Inc.’s international competition, which will be held in Halifax, Nova Scotia later this year. The chorus also won the Rising Star Award for showing the greatest improvement in scoring over the previous year. Harmony Heritage, based in Pawtucket, RI, competed with 9 other choruses in Harmony, Inc.’s Area 2, which encompasses all of the New England states plus Montreal. The competition took place in Devens, Massachusetts in April, and participants earning a score of a certain threshold are qualified to participate in the international competition of Harmony, Inc. choruses in November. With approximately twenty members, Harmony Heritage is directed by Bob O’Connell of Pawtucket, RI. The chorus presented two songs from the 1940’s at the area contest to earn its qualification, “We’ll Meet Again” and “That Old Feeling”. These selections are a small sample of the chorus’s extensive repertoire, which is ideally suited for a wide range of audiences and events. To learn more about the chorus’s upcoming performance schedule, visit http://www.harmonyheritage.org. Harmony, Inc. is an international, non-profit organization whose purpose is to empower all women through education, friendship and a cappella singing in the barbershop style. Since 1959, the organization has expanded from its Eastern roots in Providence, RI to include more than 60 chapters in the United States and Canada, from California to Newfoundland, and from Manitoba to Florida. For more information, visit HarmonyInc.org. Harmony Heritage Chorus—the Pawtucket, RI chapter of Harmony, Incorporated, an international organization of female a cappella singers specializing in the barbershop harmony style—will lead a harmony performance and workshop at the William Hall Library on Wednesday, Apr 19 from 6:15-7:45 PM. Under the direction of Bob O’Connell, this participatory event will show how the four different voice parts – tenor, lead, baritone, and bass – work together, while showcasing the wide range of musical possibilities contained in this timeless style of a cappella singing. Members of the audience will be invited to try out the parts and to sing with us. Both audience and participants alike will share the joy that we experience in the unadorned and seamless blending of voices and the magic that occurs when those voices “lock and ring”. This program is free and open to the public. For more information about Harmony Heritage chorus, visit http://www.harmonyheritage.org or call Barbara-Ann MacIntosh at 401-560-0073 or Mary Levasseur at 508-336-6956. Pawtucket, Rhode Island, March, 2017 — Harmony Heritage Chorus, the Pawtucket, RI chapter of Harmony, Incorporated, an international organization of female a cappella singers specializing in the barbershop harmony style, will lead a free harmony performance and workshop at the Rochambeau Library on 708 Hope Street in Providence. The workshop will take place on Monday, March 20th from 7:00 – 8:30 PM. This free, participatory event will show how the four different voice parts – tenor, lead, baritone, and bass – work together, while showcasing the wide range of musical possibilities contained in this timeless style of a cappella singing. Members of the audience will be invited to try out the parts and to sing selected songs with the chorus. Founded in 2001, the Southern New England chapter of Harmony, Inc., also known as the Harmony Heritage chorus, brings four-part a cappella harmony to the local community through regular performances and educational events. The chorus consists of women representing a wide range of musical backgrounds, from novice to trained professionals, and performs under the direction of Bob O’Connell. Harmony Heritage rehearses at 7:15 PM on Tuesdays at St. Paul’s Episcopal Church, 50 Park Place, Pawtucket, RI. For more information, visit www.harmonyheritage.org . Harmony, Inc. is an international, non-profit organization whose purpose is to empower all women through education, friendship and a cappella singing in the barbershop style. Founded in Providence, RI in 1959, the organization has expanded from its Eastern roots to include more than 60 chapters in the United States and Canada, from California to Newfoundland, and from Manitoba to Florida. For more information, visit www.HarmonyInc.org . St. Kevin Parish Christmas Concert at 7 p.m. in the church. St. Kevin’s Choir will be joined by St. Rita’s Choir, and the concert will also feature music by Harmony Heritage (an all women’s barbershop chorus), soloists performing Christmas and Broadway classics, surprise guests, and even a visit from Santa Claus. The concert is free, but a canned goods donation is much appreciated. The church is located at 333 Sandy Lane in Warwick, Rhode Island . Harmony Heritage Chorus, the Pawtucket, RI chapter of Harmony, Incorporated, an international organization of female a cappella singers specializing in the barbershop harmony style, will lead a harmony performance and workshop. This participatory event will show how the four different voice parts – tenor, lead, baritone, and bass – work together, while showcasing the wide range of musical possibilities contained in this timeless style of a cappella singing. Members of the audience will be invited to try out the parts and to sing with us. Both audience and participants alike will share the joy that we experience in the unadorned and seamless blending of voices and the magic that occurs when those voices “lock and ring”. For more information about Harmony Heritage chorus, call Barbara-Ann MacIntosh at 401-560-0073 or Mary Levasseur at 508-930-5362. This event is free and open to the public and is presented in cooperation with the Coventry Public Library. Harmony Heritage Chorus, the Pawtucket, RI chapter of Harmony, Incorporated, an international organization of female a cappella singers specializing in the barbershop harmony style, will host a New Singers Night on September 20th. Female singers of all ages and musical backgrounds are encouraged to attend the event, which will take place at 7:15 PM p.m. at St. Paul’s Episcopal Church, 50 Park Place in Pawtucket, RI. New singers attending will learn about how the different voice parts blend to make that unique barbershop sound and will have an opportunity for voice placement and singing on the risers with the chorus. Parking for this event will be in two municipal lots on Park Place, both a short walk from the church. Many thanks to all who joined us in the singing of our National Anthem at McCoy Stadium on July 27th, including former members, guests and members of Notable Blend women’s chorus in Taunton, Massachusetts. A joyful rendering of the Star Spangled Banner was enjoyed by all! Harmony Heritage will return to McCoy Stadium on Tuesday, August 9th. Please join us for a patriotic sing and a great home game! Ladies! Do you like to sing? Would you like to sing at a baseball game? is inviting you to join us as we do just that! Come to two of our rehearsals this summer and Sing the National Anthem with us at a Pawsox Game at McCoy Stadium! On May 17th, Harmony Heritage held its annual Installation of Officers and Directors for the 2016-2017 year. Installing officer Melanie Menzies presided over the ceremony and the swearing in, which took place at the Jamestown home of Barbara-Ann and Bill MacIntosh. Congratulations to all, and we thank you for assuming the mantle of leadership! Special thanks to Melanie for conducting a beautiful and thoughtful ceremony, to Barbara-Ann and Bill for hosting, and to our Director, Bob O’Connell, for bringing so much energy and expertise to our rehearsals and performances! To view more photos of the Installation, go to our Facebook page. Press Releases, Upcoming Events and Performances, Welcome! Harmony Heritage chorus, the Southern New England chapter of Harmony, Incorporated, an international organization of female a cappella singers specializing in the barbershop harmony style, will head to Devens, Massachussetts this week to participate in an area contest that could qualify the local singers for an international competition later this year. Area contests for choruses and quartets will be held on May 13th and 14th at the Devens Common Center. Harmony Heritage will go head to head with nine other choruses in Harmony, Inc.’s Area 2, which spans from Northeastern US, Quebec and parts of Ontario. The competition will determine area rankings, and participants earning a score of a certain threshold are qualified to participate in the international competition of Harmony, Inc. choruses in November. Nineteen quartets will also compete for the Area 2 Championship, and qualifying quartets will go on to the International competition. Harmony, Inc. has hosted area and international conventions for more than 50 years, gathering female singers of all musical backgrounds and experience levels to participate in a series of competitions for quartets and choruses. Participants are adjudicated by a panel of trained judges evaluating categories that encompass what songs the performers elect to sing, the skill with which they sing those songs, and how they present the songs, which can include emotionally connecting with the audience. With 20 members, Harmony Heritage is directed by Bob O’Connell of Pawtucket, RI. Congratulations to Kim Thompson, our most recent addition to the chorus! Kim came to us on New Singer Night in February and has been rehearsing with us in the Lead Section every Tuesday since. Now living in Providence, Kim followed her IT job from Connecticut to Rhode Island four and a half years ago. Early this year she was remembering how much she enjoyed her brief time with Silk ‘n Sounds in New Haven, and she went online to look for a chorus in this area. It is our good fortune that she found us, and we are very pleased that she will be joining us at AC&C in May. Welcome, Kim! Harmony Heritage Chorus, the Pawtucket, RI chapter of Harmony, Incorporated, an international organization of female a cappella singers specializing in the barbershop harmony style, will lead a harmony performance and workshop. This participatory event will show how the four different voice parts – tenor, lead, baritone, and bass – work together, while showcasing the wide range of musical possibilities contained in this timeless style of a cappella singing. Female members of the audience will be invited to try out the parts and to sing with us. Both audience and participants alike will share the joy that we experience in the unadorned and seamless blending of voices and the magic that occurs when those voices “lock and ring”. This program is free and open to the public through a sponsorship from the Friends of the Seekonk Public Library. For more information: www.seekonkpl.org or contact: library@seekonkpl.org. Press Releases, Recent Photos, Welcome! We are most pleased to welcome Patti Brennan as the newest and most enthusiastic member of Harmony Heritage. Patti came to us in January after her husband Mike joined the Narragansett Bay Chorus. After being blown away by the barbershop sound, she promptly went out in search of a chorus of her own. “Why should he have all the fun?”, she said. Patti first embraced the chorus repertoire as a Bari, and is now training as a tenor. Either way, we are delighted to have her aboard! President Anne Diggle officially welcomes Patti as a member of Harmony Inc.
On May 14th, Harmony Heritage installed new Directors for the 2014-15 season. We thank outgoing Directors Anne Diggle and Barbara Gruber for their service over the past year. We also thank Diane Coates of New England Voices in Harmony for being our installing officer. Wow! Who are these lovely ladies? What a blast! Creativity reigned as we flexed our vocal muscles and put ourselves out there, many of us for the first time. Can’t wait for the next one on Septemer 17th! Many thanks to our judges, Downtown Crossing, and to Mike Streeter for the great photos! NoteAble Blend and Harmony Heritage women’s a cappella choruses will bring joy to the holiday season with a special performance at the Good Shepherd Presbyterian Church at 2 PM on Saturday, December 8, 2018. The church is located on 701 Foundry Street in South Easton, Ma. The choruses will present a wide-ranging holiday repertoire and put a contemporary spin on classic caroling. NoteAble Blend and Harmony Heritage are local chapters of Harmony Incorporated, an international organization of female a cappella singers specializing in the barbershop harmony style. “This holiday program is one of the highlights of the year for NoteAble Blend audiences,” says Kim Thompson, Harmony Heritage chapter president, “and we are pleased and honored to be joining them this year”. The show will feature two choruses, guest quartets and several chapter quartets, as well as raffles, refreshments and a lot of good old 4-part a cappella music to start the holiday season. The performance is open to the public, and good will donations will be accepted at the door. All donations will benefit the Good Shepherd Presbyterian Church. The NoteAble Blend and Harmony Heritage choruses sing in the barbershop harmony style, which traces its musical roots back to the turn of the 20th century. Today, barbershop harmony singers not only celebrate the classics, but also put their own spin on contemporary songs as well. 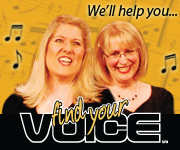 Harmony Heritage and NoteAble blend will join voices in an interchapter show on Saturday September 8 at 2:00PM at the Original Congregational Church on 1 East Street in Wrentham, Ma. Along with the 2 choruses, the show will also feature the Harmony, Inc championship quartet “For Heaven’s Sake” and several other quartets. There will be a silent auction and snacks during intermission. Tickets are $15 for Adults and $12 for Seniors/Children .